Turbo Tourney 2019 and Turbo Tourney Pro 2019 have been released! Why not get started right away, just click here to download the 2019 versions now! Never Score Another Pick Sheet By Hand Again! NOW AVAILABLE: Turbo Tourney 2019 and Turbo Tourney Pro 2019! Turbo Tourney 2019 and Turbo Tourney Pro 2019 are the premier software tools for managing your sports office pool or online contest. Since 1994 we have been providing everything you need to make running your office pool fun again and will amaze your players! Why wait... join the fun now! The Madness Has Begun... But It's Not Too Late! Turbo Tourney has been featured on ESPN.com, Sports Illustrated, USA Today Live, Internet Tonight/ZDTV, The Wall Street Journal, The New York Times and many more! "Turbo Tourney is a quick and easy way to set up an office pool for basketball tournaments. The NCAA or NIT tournaments will be a snap to run with Turbo Tourney, which gets you organized quickly and professionally." Turbo Tourney is an automated pool manager for your college basketball tournament pool. You can collect entries on the web and download them directly into your pool with just a few clicks. Turbo Tourney takes all the work out of this time-consuming and error prone task. You setup all your options, customize your pool parameters and let Turbo Tourney do the rest! 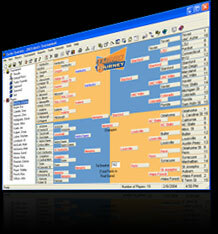 Turbo Tourney Pro is an all-purpose sports pool manager intended for just about any type of pool. In addition to all the features of Turbo Tourney, the Pro version includes templates for the weekly NFL season, College Bowl Games, NFL Playoffs, NHL Playoffs, MLB Playoffs, NBA Playoffs, World Golf Match Play Championships and more so you can run pools all year long! You can also build your own custom pool. Click here for a complete list of templates.